For most video shooters, one of the first creative prime lenses to dive into would be a 50mm. It offers nice framing, good focal distance (not too wide not too far), and typically these lenses are accompanied by a a wide aperture for that super shallow DOF 'depth of field' look. 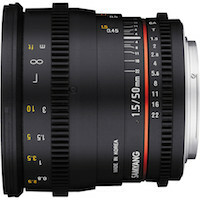 The 50mm T1.5 AS UMC Cine Lens from Samyang is a fast manual focus prime lens. It provides a maximum aperture of T1.5 for effective low light capture and shallow depth of field control and an 8 blade iris for attractive bokeh. Optimized for cinema and video applications, the focus and aperture control rings are outfitted with industry standard gearing, which provides an interface for working with a traditional follow focus. The aperture control ring has also been de-clicked, which enables smooth iris pulls. In addition, bright aperture and distance markings are printed on the lens barrel facing laterally to facilitate easier control by a focus puller. Posted in dslr video. Tags: Canon EF 50mm, Cine Lens, declicked aperture, Lens Gear, Manual Lens, Samyang 50mm on August 25, 2014 by Emm. Another news bit from them, starting with this 50mm they'll also be releasing updated version of all their previous cine lenses, now marked DS. They will all have the aperture and focus rings at the same spot (awesome for follow focus users) and apparently will be better color matched. Too expensive for a 50mm, several other options out there from Nikon and Zeiss for that price. Also to @Mydaddy 50mm designed lens is a 50mm. You simply cannot get the bokeh/compression from a 100mm or a 25mm with a 50mm lens. Different cameras with smaller/larger sensor will have different field of views, but make no mistake a 50mm lens is a 50mm lens whether it's on a 5D or GH4. This sounds really nice until you realize the 50mm mount for the 4/3 mount isn't 50mm. Yeah, a used Zeiss ZF or Contax 50mm f1.4 is quite a bit cheaper than this, and offers superb handling and excellent image quality. Unless this Samyang version beats them, we still have to wait and see if the price point is justifiable. would be awesome, if they made a geared zoom lens. btw. the companys brand name here where i live is "walimex"
....... 50mm 1.4 $550 USD. I would go for Sigma art paying a bit more. @Daniel Hughes - Probably not anytime soon. It's a decent lens for those who want that manual Cine style, but i'm pretty set with a 50mm already. will you be getting your hands on this lens any time soon? The company is korean and is called Samyang, which is the name the lenses go by in Europe and Asia. Isn't a bit weird that the longer focal lengths are shorter than their wide angle lenses, its usually the other way around. Anyone know why? Notably, they continue to (stubbornly) make available only product photos in EF mount, but you can expect a significantly larger form factor on the mirrorless mounts with that extra flange distance extending from the base of the lens barrel. @Caleb T - Yes they appear to all be made from the same place with different branding. Popular is Rokinin and Samyang, but also found under Bower, Vivitar, etc. This is exciting. 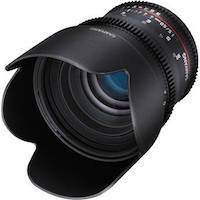 I wonder why this is being sold under the Samyang name when the rest of the "cine" lenses are marketed as Rokinon. They are the same company, are they not? The 50mm we have all been waiting for, yipee!